Dr. Samantha Hansen was recognized by the Alabama House of Representatives for the Presidential Early Career Award for Scientists and Engineers that she received from the White House earlier this year. 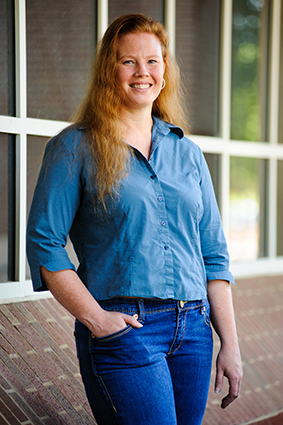 From the September 2014 edition of Desktop News | Dr. Samantha Hansen, assistant professor in the department of geological sciences, was recently honored by a resolution in the Alabama House of Representatives that recognized her accomplishments in winning a Presidential Early Career Award for Scientists and Engineers from the White House earlier this year. Hansen received the PECASE award from President Obama during a reception at the White House in April. “Commendations and congratulations are herein conveyed to Dr. Samantha Hansen on her outstanding achievement,” the resolution reads. “In all her endeavors, she has earned respect for her exceptional abilities and tireless dedication and is truly deserving of the significant honor bestowed upon her. A PECASE award is the highest honor bestowed by the United States government on science and engineering professionals in the early stages of their independent research careers. Winners are selected from the already small group of researchers who received funding from prestigious national agencies. Hansen was selected after winning a $715,000 CAREER grant from the National Science Foundation. She was among 102 researchers recognized by the White House this year. As part of her research, Hansen is using energy signals from earthquakes occurring worldwide to image the Transantarctic Mountains. Much of the mountain range is covered in deep layers of snow and ice, and imaging the mountains is an attempt to better understand how the range formed some 55 million years ago across Antarctica. Hansen earned her bachelor’s and master’s degrees from the University of Wisconsin, Madison, where she triple majored in engineering, geophysics and geology as an undergraduate. She earned her doctorate from the University of California, Santa Cruz, and completed her post-doctoral work at Penn State before joining the UA faculty in 2010. Read more about her research at www.as.ua.edu/home/from-ua-to-antarctica-to-the-white-house.